he well-received BookHabit is about to get another update. Nothing too fancy. I'm trying to keep the updates digestible and as reliable as possible. Putting too much into a point release is just asking for trouble. This one tightens up the look of the app, really improves the timeline graph and adds a few friendly features to existing screens. Some speed improvements and many squashed bugs are also part of this release. Thanks to everyone who has hit the "Send" button if they have run into something that crashed the program. It has helped make this next release much more solid. 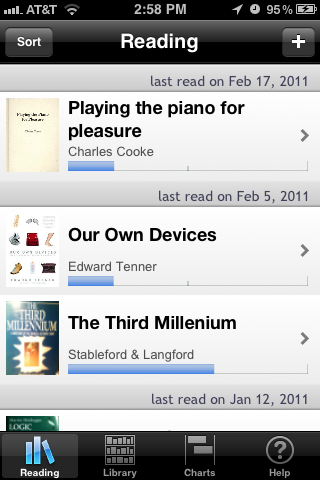 As an aside, I noticed that my own copy of BookHabit on my 3GS phone, which I am using to track over 750 books and about 30 different lists, including lots and lots of custom cover art, only takes up about 100M on the phone. In other news, there will be an official Release Party for BookHabit, if you're in Chicago on November 7th, at Tiny Lounge. We'll be having drink specials (the bar also features much-better-than-bar-food food) and door prizes, including demos of the program and a chance to yap about iPhone development in general. There will also be other iPhone developers there to mingle with, and also many people who are just there to enjoy themselves and have nothing whatsoever to do with iPhone development. =] Please come and just enjoy the evening! More info about this in the next week or two. I'm still trying to get everything together for it.